The Canadian Dollar suffered during a choppy 2018 that was dominated by trade talks and oil prices more than domestic economic indicators. Trade talks are not over, nor the growing impact of oil and 2019 may see these feature in a different form, at least early in the year, before Canada's general elections take over the scene. 2018 was a turbulent year for USD/CAD which had a range of some 1,400 pips with a lot of ups and downs, but an overall uptrend. The year began with rising oil prices and hopes for an ongoing expansion in Canada, partially thanks to US stimulus. Things became complicated with the US tariffs on steel and aluminum and the impasse on negotiating a new trade deal to replace NAFTA. The Mexican concessions to the US did not immediately result in accord with Canada as well, and uncertainty grew. When an agreement, newly christened as the United States Mexico Canada Agreement (USMCA) was reached, the loonie recovered. But it had only a few moments to enjoy the relief as oil prices began plunging. USD/CAD ends the year close levels last seen in mid-2017. The economy had a slow start to the year and then things gradually improved. The uncertainty about trade took its toll on investment decisions and growth. During the year, the Bank of Canada raised rates, but changed its mind according to the situation, quite a few times. The BOC proved to be genuinely data-dependent, at a higher frequency than its peers in the US. 2019 - a comeback year for the loonie? 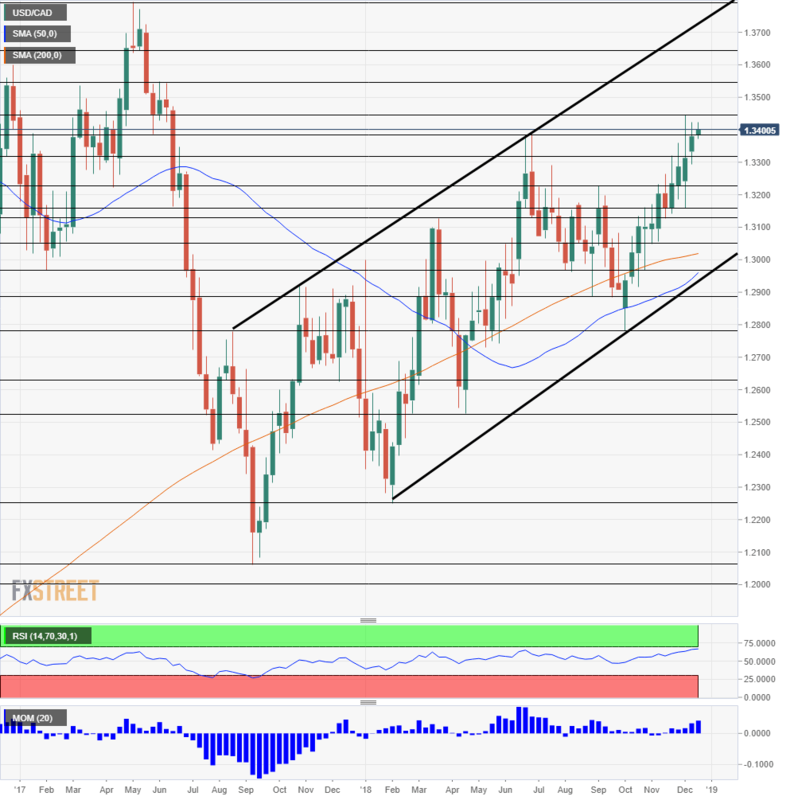 USD/CAD was on the rise due to weaknesses in Canada and a surge in the USD during 2018. The greenback may peak during 2019 as the Fed pauses or halts its tightening policy and as Trump may prefer rising stocks to fight trade wars. We start with a risk factor for the Canadian Dollar. Leaders signed the new trade agreement on the sidelines of the G-20 Summit in Buenos Aires, but it still needs to be ratified. There should be no problems on the Canadian side, but things are more complicated south of the border. President Trump wants to tear the current deal, NAFTA, which he often described as the "worst trade deal ever." Trump can cancel the old accord while Congress needs to approve the new one. Democrats won the House of Representatives in the recent Mid-Term Elections and may not be in a hurry to do so. There is a risk that NAFTA is canceled while the USMCA is not ratified. The scenario is unlikely but may pose a considerable threat to Canada. Democrats would like to strengthen labor protections while each representative has a district to work for. A long delay in the process may create uncertainty which may have an adverse effect on the Canadian economy and the Canadian Dollar. Trade is currently on the sidelines of the factors moving the C$, but it remains a risk factor that should not be forgotten. Oil prices are falling, and the prospects are not shiny for the black gold amid a supply glut and falling global demand. See a separate oil forecast for the full details. However, here is Canada's opportunity to shine. Canadian Crude, the Western Canadian Select (WCS) representing Canada's heavy tar-sands crude, traded at a heavy discount against the benchmark American West Texas Intermediate. The broad spread was the result of bottlenecks in shopping Canadian oil to ports in the Gulf of Mexico. Rising US shale oil and limited pipeline capacity weigh. The regional government of Alberta took the unusual decision to announce a production cut, and WCS instantly jumped. The government in Edmonton may continue managing supply in 2019 to maintain reasonable prices. More importantly, lower global oil prices may cause some shale producers to halt production in unprofitable rigs. The US fracking industry has shown its flexibility amid fluctuating oil prices. Fewer competitors in North Dakota or the Permian Basin mean a better flow for Canadian oil stemming from Fort McMurray. Another potentially decisive factor for Canadian oil is the construction of the Keystone XL Pipeline that may begin in 2019. The project is held up in US courts due to environmental concerns, but the Trump Administration would like to see it through. Justin Trudeau was swept to power in October 2015 and will face voters in October 2019. The Liberal government legalized cannabis consumption and is seen as a standard bearer for liberals across the world. However, its economic policy cannot be described as left-leaning. Under Trudeau, Canada remained staunchly pro-trade. The Prime Minister also battled regional governments in promoting not-so-environment friendly projects. The re-election of Trudeau would represent continuation and stability, especially around trade. His Liberal Party is the favorite to win the poll. A victory for the center-right Conservative Party would be a more market-friendly outcome, but seems unlikely and would not make a huge difference. So far, Canada has not been plagued by the populist wave engulfing the US and several European states. The chances of an anti-globalist, anti-immigration trend are meager. What we can expect, albeit moderately, is some kind of election-economics. Governments facing elections tend to open up the purses and to woo voters. The Canadian economy does not require extraordinary stimulus and populist measures are unlikely, as measured earlier. Nevertheless, an election year could see a touch of generosity from Ottawa, and that may help the C$. 4) Immigration - enhanced human stimulus? Contrary to Trump's anti-immigration stance, Canada is quite open to newcomers. The points system allowed skilled migrants to contribute to the economy and this trend is set to continue, especially under the Liberal Government. The flow of migrants may increase in 2019 as Trump becomes keener on building the wall on the Mexican border and the policy remains hostile in general. Canada may offer fewer opportunities, and the cold weather deters many, but a warmer welcome may win the cold weather amid potential immigrants. Canada's policy has been dubbed "human stimulus." by the BOC and is unlikely to change anytime soon. A potentially Conservative government or coalition is not expected to reverse the trend. BOC Governor Stephen Poloz reacts to the data and the news. While he did not assume the worst outcomes when trade talks were stuck, the BOC responded to incoming data in both directions. The current bias of the central bank remains hawkish, with further rate hikes due in 2019. The pace may be gradual, and a lot depends on inflation. Any figure can change the Bank's mind. With only eight meetings a year and four including press conferences, it will be critical to keep track of speeches by Poloz, Deputy Governor Carolyn Wilkins, and others. Opinions can change quickly, triggering volatile moves in USD/CAD. The BOC may raise rates twice in 2019. As we have already seen in the US, the markets may become more sensitive to wages. Salaries for full-time workers dropped in the past six months, and if the trend extends into 2019, the BOC may refrain from raising the rates. However, the overall economy is doing quite well, and wages are likely to turn around. Two Canadian hikes with no clear pause, coupled with a halt in the US, shifts the balance in favor of CAD. We use the weekly chart to see the big picture. Dollar/CAD is trading in a broad uptrend channel as marked by the thick black lines. However, the Relative Strength Index (RSI) is close to 70, indicating overbought conditions. Here are the lines to watch from top to bottom. 1.3780 was a peak in April 2017 and stands out in the chart. In May of that year, 1.3640 provided some support. 1.3550 capped USD/CAD back in June 2017 and also earlier that year. The next line already brings us to 2018. 1.3445 was the high point in December 2018. 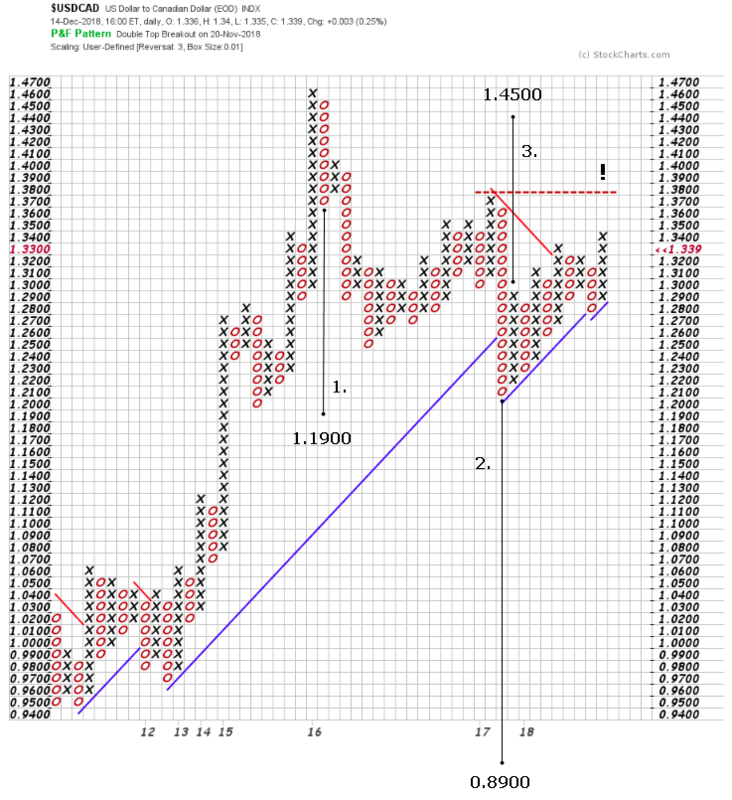 It is followed by 1.3380 that capped $/CAD in June and forms part of uptrend resistance. 1.3320 was another step on the way up in late 2018. 1.3225 was a line of resistance in September 2018 and also worked as support in April 2017. 1.3150 was a swing low in late 2018 and 1.3125, close by, capped the pair in March. 1.3050 was a cushion in November 2018 and also in the summer. 1.2970 was a stubborn support line in August 2018. 1.2880 served as a double-bottom in the summer of 2018, and it is followed by 1.2775 which was a swing low in October. Further down, 1.2635 was a swing low in December 2017, and 1.2520 held the pair from falling in April 2018. 1.2260 is where the uptrend support began back in February 2018 and the yearly low. 1.2080 was the trough in the summer of 2017 and 1.2000 is a very round number. The fact that count 1. has been left unfilled by 200 pips or less when staging the low of 2017 is in itself a sign the Canadian dollar remains vulnerable against the US dollar. Nevertheless, that disturbing large column of Os in 2017, because it changed the technical picture for this pair, became the source of a bearish count (2.) towards 0.8900 which is still active. The very next column though, because it reversed 50% of the previous slump, deserved a vertical count as well, this time a bullish one towards a modest 1.4500 figure. The premise here is that only if the 1.3800 remains intact, then a bearish scenario could unfold. Otherwise, a break of that level eyes 1.4500 as next halt. 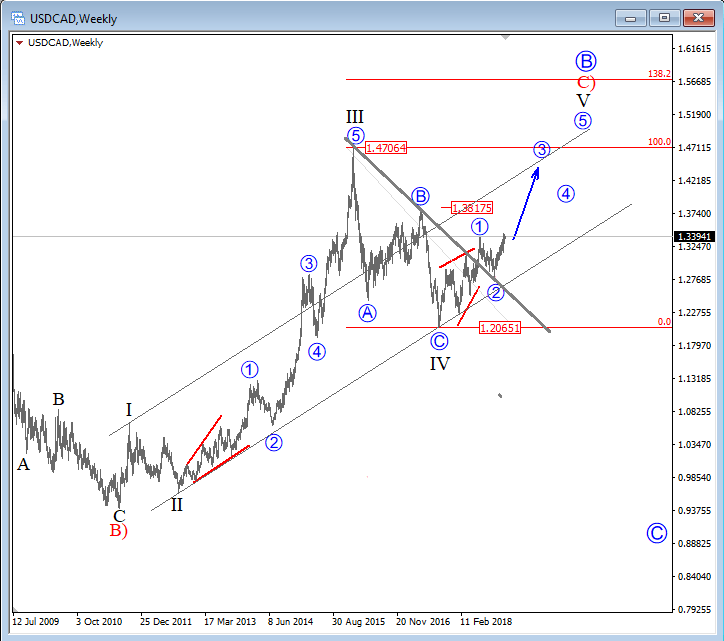 USDCAD is in an uptrend since 2011, unfolding a clear and beautiful five-wave price move. We specifically see price resuming the uptrend now, after broken trendline resistance that became good support so price may continue higher into wave V of C). Ideally pair may be headed back to 1.4700. After a down year for the Canadian Dollar, 2019 could be entirely different. The relative strength of Canadian oil prices and an ongoing tightening by the BOC against a pause by the Fed will likely support the Canadian Dollar. Further support may come from the elections and immigration. A risk factor is the trade agreement, which is yet to be ratified.